Legaspi and Reinald Cinconiegue were arrested in a drug buy-bust operation in Barangay Cogon, Tagbilaran City at 10:15 a.m. on Sunday. Police on Sunday seized packets of shabu worth P115,600 from two alleged drug dealers during an anti-drug operation in Tagbilaran City. 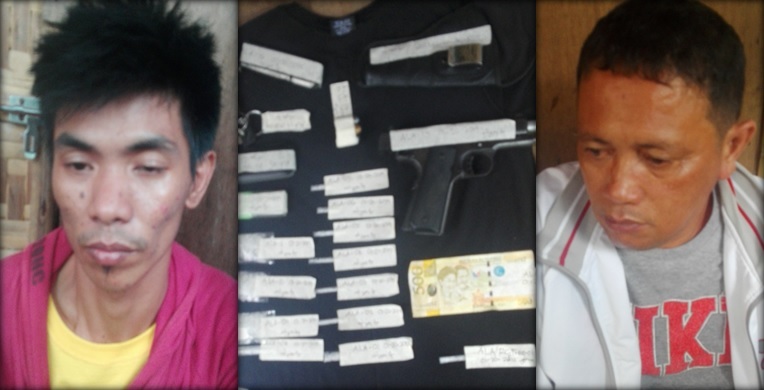 The suspects, identified as Reinald Cinconiegue, 45, of Barangay Biking, Dauis and Ariesteo Legaspi, 30, of Barangay Cogon, Tagbilaran City were arrested through a drug buy-bust operation. According to police, Legaspi was also caught in possession of a .45 caliber pistol with one magazine and two live rounds, violating the in effect Commission on Elections gun ban. Police said that Conconiegue was spotted selling illegal drugs in Purok 6 of Barangay Cogon in Tagbilaran City prompting operatives to set up the sting operation. An undercover cop transacted with Conconiegue but it was Legaspi who allegedly handed over the shabu. Conconiegue and Legaspi were immediately arrested and yielded 17 grams of shabu. Both men are now detained at the Tagbilaran City Police Station lock-up facility.